Do you have what it takes to join our first class team? If you think so, why not let us know? We are a long established family company installing windows, doors and conservatories in and around the Hertfordshire, Buckinghamshire, Middlesex and North West London areas. We are proud of our reputation for exceptional customer service and after sales, and our installations manager will be a leading integral member of our team delivering this service to all of our customers. Responsible for running our surveying and fitting teams, you will have the professional skills necessary to provide a quality surveying service with confidence and accuracy. You will be experienced within the glazing industry and hold the required NVQ Level 3 qualifications in Glass Related Operations and Fenestration Surveying. Do you have a good understanding of Building Regulations and the importance of the technical survey? Do you have a good rapport with customers and the ability to explain technical details with clarity and precision? Are you able to work under pressure to tight deadlines with assurance and accuracy? If so, you could be just who we are looking for! 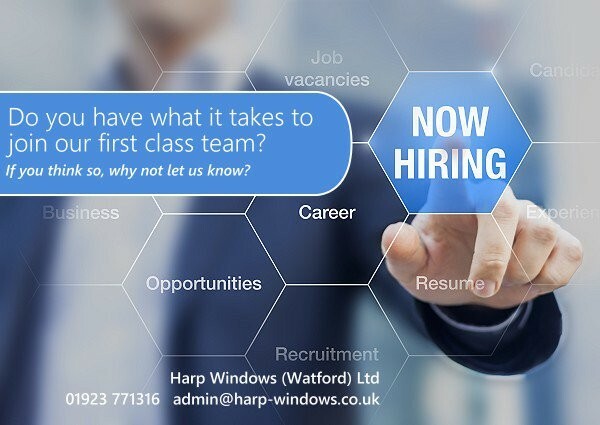 For the right person we are offering a great package, so if this sounds like you please email us your up-to-date CV and covering letter to admin@harp-windows.co.uk.